Posted by Vishwesh Nath on Monday, February 15, 2016 in Computed Tomography, Neuroimaging. Shikha Chaganti, Andrew J. Plassard, Laura Wilson, Miya A. Smith, Mayur B. Patel, Bennett A. Landman. A Bayesian Framework for Early Risk Prediction in Traumatic Brain Injury. In Proceedings of the SPIE Medical Imaging Conference. San Diego, California, February 2016. Early detection of risk is critical in determining the course of treatment in traumatic brain injury (TBI). Computed tomography (CT) acquired at admission has shown latent prognostic value in prior studies; however, no robust clinical risk predictions have been achieved based on the imaging data in large-scale TBI analysis. The major challenge lies in the lack of consistent and complete medical records for patients, and an inherent bias associated with the limited number of patients samples with high-risk outcomes in available TBI datasets. Herein, we propose a Bayesian framework with mutual information-based forward feature selection to handle this type of data. Using multi-atlas segmentation, 154 image-based features (capturing intensity, volume and texture) were computed over 22 ROIs in 1791 CT scans. These features were combined with 14 clinical parameters and converted into risk likelihood scores using Bayes modeling. We explore the prediction power of the image features versus the clinical measures for various risk outcomes. The imaging data alone were more predictive of outcomes than the clinical data (including Marshall CT classification) for discharge disposition with an area under the curve of 0.81 vs. 0.67, but less predictive than clinical data for discharge Glasgow Coma Scale (GCS) score with an area under the curve of 0.65 vs. 0.85. 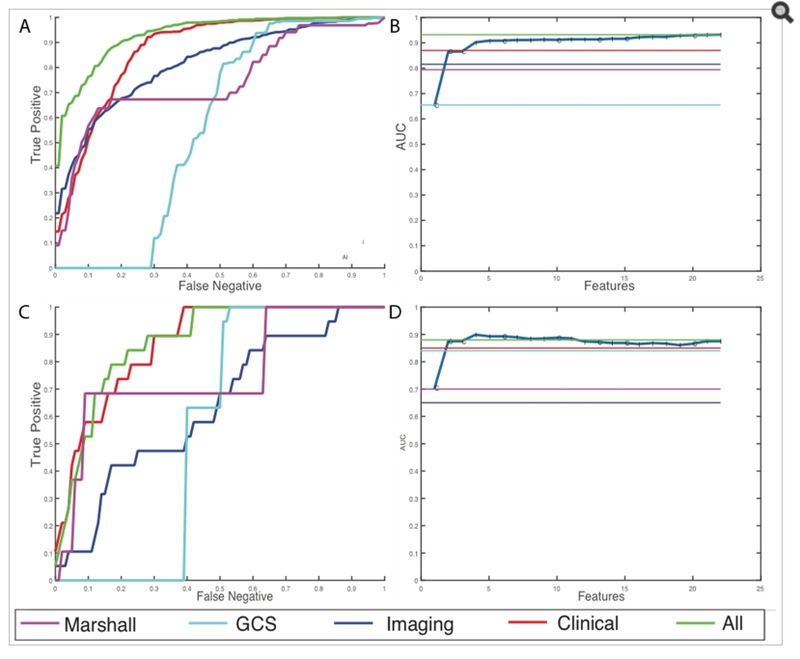 However, in both cases, combining imaging and clinical data increased the combined area under the curve with 0.86 for discharge disposition and 0.88 for discharge GCS score. In conclusion, CT data have meaningful prognostic value for TBI patients beyond what is captured in clinical measures and the Marshall CT classification. Results for prediction of high-risk discharge GCS cases (a) Average ROC curves internal cross-validated sets (b) Average effect of each new feature that is added via the greedy feature selection method (c) ROC curve for the holdout dataset (d) Effect of each new feature that is added via the greedy feature selection method in the holdout dataset.